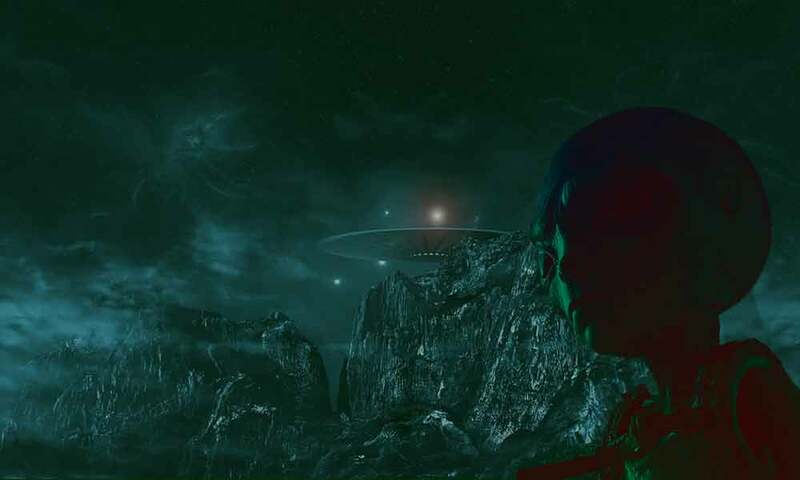 The science fiction film Prometheus gives the impression that life upon earth might have been created artificially by intelligent aliens from another planet and they might have used the earth as an experimental laboratory or a natural park to produce various life forms and study them or test them. While we do not know whether it ever happened, it is possible that we, the human beings, may extend life to other planets in the near future and follow a similar course. We may establish colonies, create life forms and exploit their resources. If we can do it with our knowledge and intelligence, we cannot rule out the possibility that some aliens can do the same. This leads to some interesting speculation about God and the nature of creation. The first question that we may have to answer in this regard is, if it is true, what are its implications to our religions and our age old belief systems? I cannot speak for other religions, but from the perspective of Hinduism, this theory does not alter our beliefs or our theories of creation as presented in our scriptures. In Hinduism, there are many schools and sects, each having a long history, tradition and belief systems of its own. Most of them portray God as either the direct or the indirect source of creation. Most of the narratives that deal with creation, do not present creation as instantaneous, but rather as a gradual separation and diversification process accomplished by the deluding power of Nature in stages under the impetus provided by God. Thus, first material objects appear with the differentiation of the five elements. Then primitive life forms appear without senses. Then some life forms appear with one or more senses, followed by beings having mind, self-awareness (egos) and finally intelligence. In other words, we have two eternal entities involved in creation, God and Nature. God is pure consciousness endowed with Supreme Intelligence. Nature is an aggregate of diverse component realities known as tattvas. The highest of them is natural intelligence, which only the humans possess upon earth. Intelligence gives us the ability to discern things, think rationally and make decisions for ourselves. Therefore, it also binds us to the law of karma. In Nature, or even in creation, three types of actions are self-evident, natural or mechanical actions, intelligent actions and chance events or acts of God. The Samkhya school of Hinduism presents Nature as a blind or mechanical force, which is also accepted partially by other schools. The argument is that Nature unlike God has no will and produces nothing new. All the effects it produces are already hidden in their causes. The natural laws, the laws of physics, chemistry and mathematics are great examples of Nature's automated functionality. In other words, Nature is a programmed entity, an automaton, a blind force, which manifests what is already present in it in seed form. Once it is triggered, it springs into actions and produces whatever effects or modifications are hidden in its domain. This mechanical aspect of Nature is more evident in case of lower life forms that are guided mostly by instincts and natural impulses. The force of Nature is very strong in them. However, the equation changes with the emergence of intelligent beings, who have the intelligence and the ability to make their own decisions and change the course of Nature and even creation if necessary. They are subject to Nature, but have a mind of their own. With their intelligence, they can arrest the processes of Nature, imitate them, improve upon them and even create new processes. With them in charge of the world, natural intelligence assumes control of life upon earth. With the help of intelligence they begin to interfere with the processes of creation and even Nature to achieve their own desirer ends. With our ordinary knowledge and intelligence, we cannot fathom the role of God in creation. We may discern it in the random acts of God (daivikam) that shape our destinies upon earth or the chance events that change the course of life as it happened several times in the past. For example, no amount of intelligence can explain the disappearance of Dinosaurs from earth or the emergence of human beings from primitive human groups. Some day our scientists may find the causes but they will not know why they happened. Perhaps chance played a role there just as chance plays an important role in major genetic mutations that happen upon earth regularly. However, while such events are inexplicable in rational terms, we can clearly discern the role of Nature and intelligence in creation, in our lives and the world in general. Every living being is a creator in its own way. We create our lives. We create our future. We create our thoughts and actions. We even create our idols, which we worship as God in image form. We are thus creators of our little worlds, the lords of our minds and bodies. Most life forms imitate Nature or follow its methods to create or procreate; but we the human beings have the ability and intelligence to subvert Nature and create things according to our will and vision. Our creativity stems from our intelligence. This intelligence is part of Nature. We have it because Nature assembled its aspects in our own minds and bodies. While we may take credit for our own creations actions and achievements, in truth their primary source is Nature only. Thus, from the above discussion, the following scenarios of creation emerge. God may be the efficient as well as the material cause of creation. With His supreme intelligence and inviolable will, He manifests Nature, individual beings and through them all the diversity that we experience through our senses. With His indomitable and indestructible power, He controls and regulates everything, establishes order and regularity (rta), decides how long the worlds should last and when they should be destroyed. This is one school of opinion that holds God as the source of all. In the diluted version, we may regard God only as the efficient cause and passive Witness. By His very presence, He provides the impetus to Nature, which is the material cause and the source of all manifestation and diversity. Triggered by the mere presence of God or souls, Nature manifests the worlds and beings and upholds them until the end of creation. This is another school, which recognizes an equal if not greater role for Nature in creation. In the more complex version, presented by this author, and which is perfectly in harmony with either of the above, we may recognize the role of not only Nature but also its aspects in facilitating creation. This is based upon the premise that whatever is produced by the aspects (tattvas) of Nature is also part of Nature only. Whatever we create with our minds, bodies, knowledge and intelligence out of desires and our individual wills is also part of Nature's creation. Therefore, in life, not only Nature but also its aspects and entities take part. For example, if some day we create life upon a planet like Mars, we may either take credit for it or ascribe it Nature from which we derive our intelligence. From this perspective it does not matter, whether God was the creator or Nature or some intelligent group of beings. Their direct source may be humans or some aliens, but their ultimate source is either Nature only or may be both God and Nature. Life upon earth is not artificial. It is created by Nature, even if we assume that it was created by a bunch of intelligent aliens from a far away planet, because their ultimate source is also Nature only. Whatever creation happened so far upon earth, with the direct involvement of Nature let us call it Creation 1.0. Whatever creation may happen, from now on, because of our knowledge and intelligence, let us call it Creation 2.0. Going by the way Nature works, Creation 2.0 is going to be very disadvantageous to human beings since most likely they will be surpassed and out numbered in every respect by the very beings they may create in future either naturally or artificially. In fact, we are already on our way to creating artificial intelligence, which is going to be far superior to our own. Those who possess it, like the robot in Prometheus, will not only set in motion a new phase of evolution but also will probably learn to control the world and the humanity like never before, just as we learned to control Nature, which has created us, by studying it and understanding it. This is not science fiction. This is a theoretical possibility. If the current trends are any indication, we are already on course to Creation 2.0. Nature is not going to manifest life upon other planets in our solar system. It may perhaps happen over a few million years if we let Nature have its ways; but we are not going to wait until then. It will be done by human beings in much less time, provided they manage to survive against their own wickedness and evil impulses and succeed in transcending their animal nature and shortsightedness. A great destiny awaits the mankind provided they are willing to stand up to the task and take responsibility for the universe they know and which they can claim as theirs instead of waiting for the destruction of the planet, so that they can ascend to a heavenly world in great rapture. In the present context, the odds are heavily against them. The world seems to set on a self-destructive path and our intelligence seems to be ineffective thus far against it.